…but I thought it would be good to blog about because some of the practical uses of it are not explored in BOL. 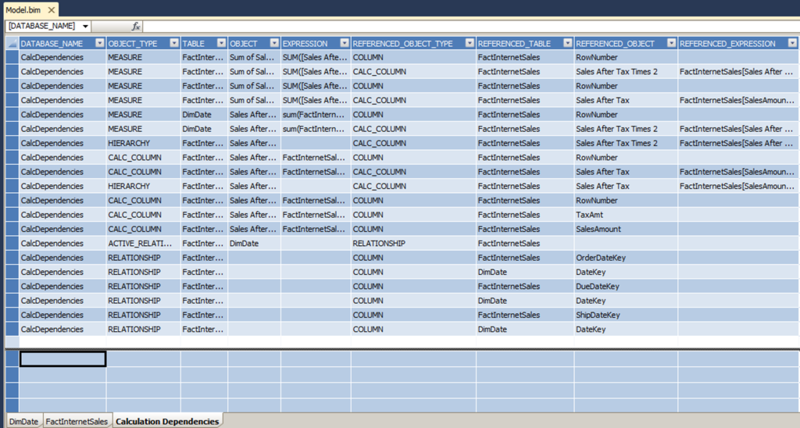 I’m sure in the future many users, especially if they’re PowerPivot users feeling a little frustrated at the lack of control they have over the Tabular model you’ve built, will be very interested in seeing these formulas so they can understand how they work and reuse them in their own models. And hopefully in the long run the information returned by this DMV will make not only importing data from Tabular models back into PowerPivot much easier, but also make importing parts of existing Tabular models into new PowerPivot models much easier. What’s the benefit of using DAX over SQL when dealing with multiple tables? I suppose the main reason is that DAX is a lot more ‘multidimensional’ than SQL (although not as multidimensional as MDX), and therefore it’s easier to build a lot of BI-style calculations such as moving averages, time series calculations, contributions and so on in DAX. A second argument is that it’s very Excel-like, which means that Excel power users (the kind of people that PowerPivot is aimed at) will be able to understand it better than SQL; I’ll admit that this isn’t really relevant to people like me though. Very nice Chris. Perfect for documentation purposes and for providing the information back to the consumer of the models. This is another feature to add in BIDS Helper! Thanks for the blog articles. Have you seen any similar tools for MDX multidimensional? I need to map out some complex dependencies between calculations that can get deeply nested. I got an error: DataSource.Error: AnalysisServices: An unexpected exception occurred.